Nothing really tops a Caesar Salad when it comes to a creamy dressing and cool, crunchy lettuce. I don't even like creamy salad dressings, but I make a rare exception for this one! The dressing is at once creamy and refreshing, with it's lemony, garlicky zing. This Caesar Salad gets a salty-sweet twist and added textural interest from the crispy bits of pancetta and sweet bites of grape tomatoes. Notes: The original recipe from Ina Garten roasts the tomatoes and calls for large chunks of pancetta, but this streamlined version saves time and keeps it fresh by serving the grape tomatoes raw. Reducing the amount of pancetta and using smaller bits, adds big flavor but still allows the salad to accompany meatier or heavier main entrees, such as in Pizza Two Ways. In a medium frying pan, cook the pancetta over medium heat until the fat is rendered and the pancetta is a deep golden brown. Drain over paper towels in a small bowl, and set aside. Make the dressing: Combine egg yolk, mustard, garlic, anchovy, lemon juice, salt, and pepper in the bowl of a food processor. Process until smooth. With the food processor running, slowly pour in the olive oil in a thin, steady stream. Continue to process until the dressing thickens. Add 1/2 cup grated parmesan and pulse until combined (about 3 pulses). There will be more than enough dressing for this recipe. Store extra dressing covered in the refrigerator for up to 3 days. 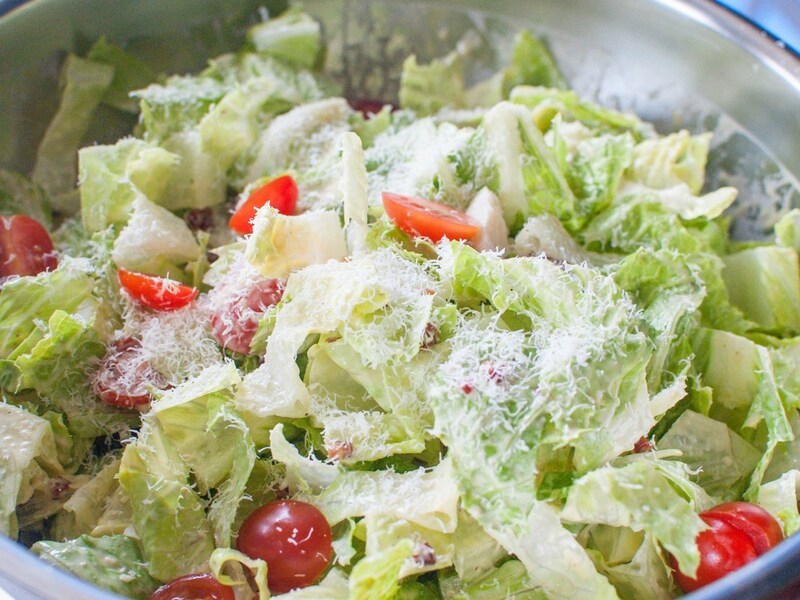 Toss together lettuce and enough dressing to moisten the leaves. Toss with 1 cup parmesan and half of the tomatoes. Divide the salad onto salad plates and top with remaining tomatoes and pancetta, and serve. *Contains raw egg: Please be aware that consuming raw and lightly cooked eggs exposes a slight risk of salmonella or other food-borne illness. To reduce this risk, use fresh, properly refrigerated, clean grade A or AA eggs with intact shells, and avoid contact between the yolks or whites and the shell.